What a WOD!!! I don’t know what I was thinking, but I forgot to write the prescribed box jump heights on the board. For some reason, I had it in my mind that I was supposed to do the 24″ box. Bad call! Ten reps into my second round, I missed the box and fell hard. 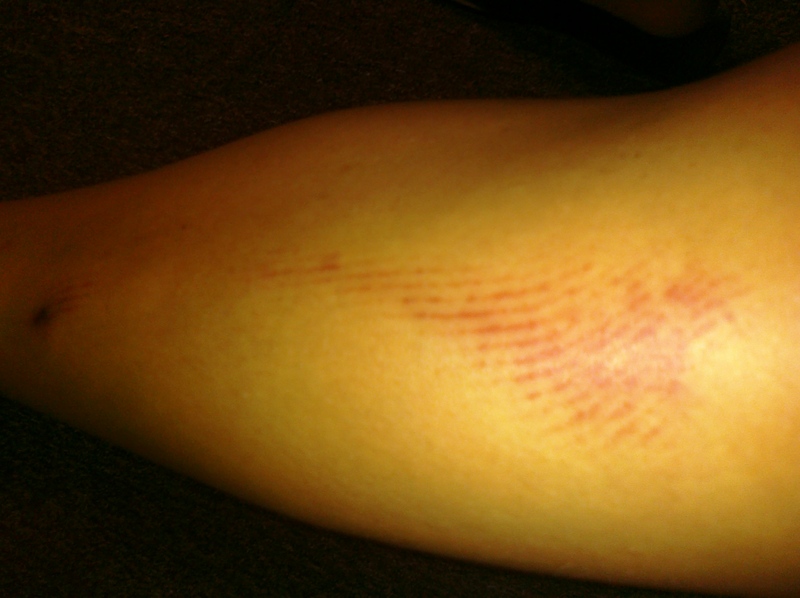 Notice the pretty little indentations on my gnarly bruise from the lines on the rubber. It hurt like hell, but I went to the 18 ” box and finished the workout. I feel like a dork for going higher than prescribed on accident, but I feel like a total badass at the same time for doing 2 rounds on a 24″ box for the first time ever. I had one of my favorite moments today. An amazing 60 yr old woman I train touched her toes for the first time in many years. When she rolled out of her stretch, she looked at me with tears in her eyes and said, “Thank you for giving me my life back.” That is why I do what I do. I am insanely proud of her awesome victory. It’s so easy for time to get away from us: our jobs, our relationships, our kids, the list goes on and on. One minute, you’re the high school quarterback. The next minute you’re, 28 with a wife, 2 kids, and 50 extra pounds. It breaks my heart to see people who were once active living completely sedentary lives. I implore anyone who’s taking the time to read this to go out and do something active today. Ride a bike. Walk around the neighborhood. Do a couple of push-ups and sit-ups. Just start moving!